© 2016 by Stephen S. Power. The Mars Light began as a ten-minute short that Bryan Sebold made without a crew after wrapping his Google fantasy series Anvil of the Sun. Now it’s a five-part documentary, which NASA Films released today online and in select theaters. Mr. Sebold spoke with me via Skype about shooting remotely on Mars; about working with the Jet Propulsion Laboratory, which runs the Mars Rover project for NASA; and about what the Mars Light is, which the documentary reveals for the first time. Warning: Spoilers below. How did your short film Curiosity lead to you directing The Mars Light? It wasn’t so much the short, Stephen, as the research and techniques that went into it. I’ll be the first to admit that my homemade rover didn’t do the original justice and my color treatment was a better reflection of my Hollywood thinking than of the Martian landscape. What appealed to JPL was how I captured the tension of driving the rover across Gale, where every pebble can put years of training to the test. They were also impressed that I left my Curiosity outside Hanksville, Utah, not far from the Mars Desert Research Station, then controlled it and its cameras from a van several miles away. And they were amazed that my route for approaching the Mars Light almost perfectly mirrored their own. But the short isn’t really about the Light. No, and that’s the most important reason I got the gig. Like many, I really wanted to believe the flashes on Mount Sharp were something fantastic, but I knew deep down that, once we took a closer look, the Light would turn out to be nothing, just another pile of rocks that looks like a face. To me, that disappointment is the essence of ugliness, and I wanted to make something beautiful. Then it dawned on me: What if the real story of the Light was the curiosity it inspired and the journey it impelled? The desire to know, not the knowing? So the Light’s a MacGuffin? Yes! I’d have put it in a suitcase, but figuring that anything I showed would have been disappointing—or, worse, cliché—I simply ended with sunlight blooming in the lens. But now everyone’s seen Curiosity’s first images of the Light. Yes, which allowed me to take a similar approach, focusing on the climb, instead of the summit. That said, unless you’re Kubrick, you can only get away with something as imagistic as Curiosity for ten minutes. Otherwise you’d end up with one of those Norwegian slow TV shows where the camera sits on the bow of a ship for thirteen hours. Fortunately, with JPL’s cooperation, I was able to create more than enough compelling footage from Earth, and by stitching together still images from Mars like animation. The only thing JPL didn’t provide was a second rover so I could get two angles on each scene. Did they ever let you steer the real rover? The closest I got was putting my hand on a driver’s shoulder—briefly, because it annoyed her. I did plan out all the shots, though, first storyboarding, then working with mission control to get what I needed. What was it like to shoot remotely? Nerve-racking at first, but, well, Hitchcockian later. Hitch considered shooting a movie a chore because he’d already made the movie in his head while planning it. Similarly, so much planning went into what we did that the execution felt anticlimactic. That said, Curiosity was well-beyond its operating life and we could never be sure the rover wouldn’t get stuck at any moment while crossing Gale, so I was able to ratchet up the tension, like sending that Norwegian TV ship through a minefield. Playing off the drivers’ tensions made this easier. Several were upset they weren’t at the center of the documentary. JPL did bring some experience to the table, too. Absolutely. America’s been at this a long time. You know the footage of Apollo 17’s Lunar Module taking off? That was taken remotely. Ed Fendell had Gene Cernan park the lunar buggy a certain distance from the module, then, seconds before liftoff, Fendell started sending commands at pre-arranged times to the camera mounted on the buggy so it would tilt up and follow the stage toward the mothership. Sadly, Cernan parked the buggy closer than he should have, and the module escaped what would have been an amazing tracking shot. So let me follow up my first question: If JPL could already shoot remotely, why bring you on? Stretch that feeling over several years and you’ll know what it was like to have made this film. Let me ask you about the three pivotal moments in Curiosity’s journey. The Crossing, The Rock, and the Face. Yes. At the first two obstacles, there’s talk of turning back, but when the rover approaches the third, and it’s clearly wearing down, JPL decides they have to press on. There is no turning back. Were you a part of these decisions? No. I didn’t steer the mission either, and to be honest I didn’t want to get in the way of what would be great moments in the film. The hero has to doubt, right? The Face worried me, though. It was the rover’s steepest, toughest climb, magnitudes more difficult to navigate than crossing the field of rocks and getting half-over, half-around that boulder. That was the only time I thought, well, I guess this really is about summiting, because if the rover falls here, we don’t have much of a film. Then, right as Curiosity got over the Face, the main computer gave out. I’ve never seen joy turn to horror faster, and I’m from Boston. I remember Buckner. But that’s why the rover has a backup ready to kick in. It turned into the funniest moment in the film, and the release of tension prepared the audience for the rover finally reaching the Light. JPL was fairly confident the flashes were the result of something reflecting sunlight. What if the reflector had been a piece of metal broken off the entry vehicle? The Orbiter did determine that the ground around it had been recently disturbed. We’d still have a great documentary, ending with the question: What else is lying around on the surface of Mars? You’re already coming under a lot of heat because JPL didn’t release all the images you had, especially those with better definition. People feel cheated. Manipulated. To use your word, disappointed. That wasn’t my decision. I didn’t agree with it, but I did agree to an NDA, so I can’t discuss it. JPL’s made their position clear. As it turns out, they played everything, especially those senators, perfectly. Because of your NDA—and those senators—can you respond to critics who think the documentary is propaganda for maintaining funding for the Mars programs? My NDA only covers internal JPL affairs. I had full artistic control over the film, provided it remain scientifically accurate, which I felt it must be, too. Nothing was faked. I used no CGI. As to the programs, of course I’m for keeping them alive. What’s the point of being the richest country in the world if we don’t spend some of that wealth on the big things? Do you agree with JPL’s findings? The director in me says they might have gone further in their speculations. I can’t imagine a natural reason for there to be a perfectly square gold tile on Mars. It didn’t crash there, although a small meteor apparently uncovered it. Was it dropped, set, or buried? By who? Or what? When the rover’s arm flipped the tile, I gasped. Do you think the marks on the other side are writing? If they are, it’s unlike any writing on Earth. It wasn’t etched into the metal or deposited onto it like ink. Most likely it’s a deformation in the metal that we’re reading our own dreams into. You made The Mars Light to stimulate wonder, yet, despite everything, you seem to resist it. Maybe some scientist rubbed off on me. They let wonder call the game, but doubt cuts the cards. Or maybe I can’t help waiting to be disappointed. It’s tough to give up that expectation, however beautiful I find the tile, because sooner or later we’ll know what it is, and can its reality ever match my imagination? Sometimes I wish we’d found nothing and the flashes remained unexplained. Will analyzing the tile be the subject of your next documentary? If I had my way—and five or ten billion dollars—it’d be about bringing the tile home. It’d be about discovering its origins. Whether we do so, sadly, is up to those senators. Nine years ago I spoke with Bryan Sebold about his film The Mars Light. His new seven-part documentary, The Gold Book, released worldwide today via cellnet, picks up the story by intercutting the retrieval of the Mars Tile with its analysis on Earth. He spoke to me from Moscow, where the film was produced by the Russian Federal Space Agency in collaboration with the European Space Agency. Warning: Spoilers below. The first film, you said, was about wonder. What’s this one about? The hard work of wonder. Anyone can say, “I want to go to Mars.” Or, “I want to make a movie about going to Mars.” But to do it? Agony. Is that why you made one film instead of two, to reinforce the agony? You could have released the Retrieval sections much sooner. Yes, but that part was seen live (with a lag), and half the mission controllers have written books about it. By intercutting the two stories, I think I’ve provided a new perspective on the retrieval—the stakes—while showing that the analysis is no less epic. That hasn’t stopped people from separating the movie into two parts, of course. I’ve read all those books and most everything else about the retrieval, so I was surprised by how many new details you had, such as how close the rover cannon came to failing. And I still left out half that story for security reasons. You can understand why. On the one hand, when you electrify a few cubic inches of hydrogen the way a hammer sparks gunpowder, you can fire a cartridge with a small gold tile out of a nanotube pipe at the escape velocity of Mars. On the other hand, were you to employ the same technology on Earth, you would have a gun that could kill a house. Was the muzzle flash, that white bloom in the rover’s navcam, a nod to your original short? Absolutely. It made for a nice fade to the tile being loaded into the CT scanner. Let me backtrack a little. In this film, you had to use CGI. Only for the two things not directly filmable: the Mars Relay Vehicle capturing the cartridge, then the MRV flinging it into Earth’s atmosphere the way Stardust sent home its sample of comet. The pictures from the MRV’s cameras were darker and grainier than we’d hoped for. Which owe less to bad lighting than they do to the jingoism of those who sat out the greatest endeavor of our age. After all, the conspiracies began with the MRV shots, not the leaked rough cut of that scene. Why didn’t you address the political controversies surrounding the mission? They’d have made it a different film, a mundane film, not one about the heavens. Besides, I had enough to cover already. Early on I decided to cut anything not about getting the tile home. Stephen, I’d like to talk about the film. Then let me ask you this: How has making the film changed you? Like most people, the shock of knowing there’s an extraterrestrial intelligence wore off pretty quickly. Now that it’s normal, it doesn’t bear thinking about. That’s probably key to our survival as a species. We tune in the unusual, the different, because they’re potentially dangerous, but once intimacy defangs the strange, we tune it out. The downside is, we then start looking for new dangers. Or old ones. A troublesome film. A troublesome filmmaker. Precisely. I can be understood in human terms. But can we understand whatever made the tile? If they’re dangerous, would we recognize that? If they aren’t, would we misjudge them? And can we even imagine how they’ll see us—figuratively and literally? Which brings us back to the tile. You lit the lab to look stark, sterile, while you gave Mars a bronze warmth. I wanted the lab to seem the more alien place because, to them, we are the aliens. We need to start seeing ourselves from their point of view. No. Because they are. Whatever they are. So there’s no warning, no threat in the tile? Don’t get Hollywood. We’re not yet sure what’s in the tile. All we know is what’s shown in the film: that it’s not a solid mass, but a stack of individual sheets of gold, thousands of them, each as thin as leaf, each bearing an even thinner layer of gold that looks like writing. We’re not sure how the tile was created, how old it is, and how it holds together. And we didn’t use CGI for the scans either. Those are the real images, just separated digitally to make what’s on each page easier to see. What if it’s none of those? What if it’s totally insignificant. Alien ephemera? Archaeologists spend their lives sifting through trash. Seems like a good place to start. As are England and half the European Union, who are supervising the analysis with them. I’ve seen no indication that they’d betray their allies. They remember the Cold War. Nothing good came of it. Secrets will be shared, hence this movie and the crowd-sourced effort to decode the tile that we’re launching alongside it. No pages will be held back? What would be the point? We don’t know what’s significant. And for all the power of our computers, they can’t replicate what hundreds of millions of creative minds can do together. At least those minds who are allowed to participate. Once America sees how this project brings the rest of the world together, they’ll jump in, too. For all the hard work that went into retrieving the tile, the more important and far harder work lies ahead: bringing ourselves together to meet the tile maker someday. Learning their language at the same time, making it our language, too, will do that. Are you prepared to be disappointed? Of course. I’m an idealist. I believe in beauty. I believe beauty can be realized. But I know it never truly can. Brynne Sebold’s documentary The Mars Light is about the discovery of the Gold Book, and its sequel, The Gold Book, is about the book’s retrieval from Mount Sharp and its analysis on Earth. For her third film in the series, she collaborated with Musion Holographic’s 3D Studio to bring the book’s contents to life. Ms. Sebold spoke to me from her home in Chartres, France, about the changing nature of film, depicting alien viewpoints and the elusiveness of beauty. Now I’ve made the slowest film ever? A lot has changed since then, including what’s a film. When was the last time a film was even shot on film? Mine’s mostly code. And who watches them in a theater facing forward? I think escaping old terms and ways of seeing are half of what Floating is about. Not expecting. In a traditional film, however convoluted its narrative, however errant its hero’s journey, there’s a beginning, middle, and end with various markers along the way. You might not know what’s coming, but you know something must be. Floating, on the other hand, focuses mostly on the time between gatherings. That is, on the vastness of space. That’s when the whale was most alert. According to the Gold Book, it estivated while rounding the Sun to protect itself, absorb energy, and create a new page. Viewers can, however, skip the journey to get to the destination. Why didn’t you disable that functionality on people’s projectors? The viewer’s the real director now. If viewers want to miss the heart of the film, so be it. People have told me, though, that the gatherings frustrate them because they disrupt the flow of floating through space the way winning aggravates people who play slots. Did you skip ahead? I had to, to prep for this interview. Did you feel like you were cheating? Yes, actually. I chose the third-person option to start so I could inspect the whale. It’s beautifully rendered. How its gold skin shimmered and ever so slightly rippled . . . I left the projector on for days so the whale could keep me company before I switched to first-person. That point of view was so soothing. The hours fell away. At first I wanted to see the stars sliding past me, then I found comfort in their apparent stasis. Our world is so well-lit, we don’t get to see the night sky as you would in space. And it’s so fast, going slow is a luxury. When I fast-forwarded, I felt like I was being shot out of a cannon. Like I might go through my front window. After rounding the Sun, which was hugely fun, I approached the first gathering at regular speed. There’s nothing like watching Mars go from gray to red. How many orbits does the film depict? Not all 6,500-something from the book. No, only the first 350. We’ll add more in the coming years, but those are the best documented orbits, people having decoded them in their linear fashion. How did you determine what to depict at each gathering? The book is more suggestive than detailed. I disagree. Each page notes how many whales ours met at Mount Sharp and how many unions it engaged in. Each page also records, we suspect, the amount of gaseous material exchanged, so it was only the mechanics of the exchange I had to decide on. There are many theories, as many as there are about the morphology of whales. I realized all could be correct, so I used them all at various gatherings, depending on the inclination and physiques of the whales. I admit that the whales with longer tails are randier than most and prefer threesomes. I’d expected the exchanges to be more mechanical, like propane tanks linked by self-extending pipes, but I found them surprisingly intimate, the way the whales’ skins melded, sealed, then opened to one other. I put on a VR suit on for the gathering, and I really felt part of me being siphoned away while I was accepting another’s essence. That bothers some people. Human exchanges are one way. When we say we share ourselves, really one person is just along for the ride. The whales literally lose themselves in each other’s skins. It makes a person reconsider his own skin and whether it’s really his or the VR suit he was born with. The parting afterwards was sudden and terribly wrenching. The book doesn’t indicate whether the whales lingered at Mount Sharp after exchanges or went their own ways. I think the “cuddlists” are overly sentimental and the “animalists” trying hard to be objective, but I had to side with the latter because I wanted to follow the book and bring people the life of the whale as it had recorded it. Personally, I imagine the exchanged material fuels them emotionally, if whales have something analogous to our emotions, during their orbits. Me, I don’t think I’ve been so lonely. I could feel each bead of cold sweat in my suit. I wanted to tear it off, like a used condom, but that seemed disrespectful. The slowness became agony. And our whale had a short migratory period, orbiting the Sun in fewer than 200 years. It only met other whales at Mount Sharp on one in seven orbits overall, but at least it had a greater chance to gather than those whales which have longer periods. Imagine going millennia without touching another person. In human terms that would be like years of solitary confinement. That’s another thing people have a problem handling, the timescale of the film. I compressed each of the film’s orbits to ninety-four days, so a viewer could theoretically spend their entire natural life watching this one film. Apparently a few kids have already started to do this. I wonder how long they’ll be able to live on whale time. Probably just long enough to get a book deal, although the ending is one of the best parts. In retrospect, I wish I hadn’t included it. Musion insisted, and I saw their point: The whale lived for more than 1.3 million years. It might seem immortal. But we aren’t. We need endings, and showing its death would make it more relatable. I’d rather have left viewers disturbed, but Musion was paying the bills. You had to do a fair amount of speculation, too. More than I was comfortable with. In the last pages of the book, the whale encounters fewer and fewer other whales, only four during its final hundred orbits and one in its final fifty. We can’t tell whether the whales were dying out, whether our whale was in a cycle that didn’t synch with those of others, or whether the whales had begun gathering elsewhere and ours hadn’t been told. It’s also possible that our whale was attending gatherings but not exchanging anymore, perhaps due to age, infirmity, or sickness, which the coding in the book, as we understand it, would misleadingly indicate as no meeting at all. We don’t know. And we can’t, at least until we find another Gold Book. All we do know is that the final page describes the whale beaching itself on Mars. It wrote the final page of the book, using markings unseen on all the other pages, but reminiscent of those on the first. Then its gasses must have leaked away and its body disintegrated, leaving only the layered gold scale that is the book. Better, I think: an epitaph. It says, to me, “I made this. I am this. This is my life.” And the book will never molder into dust like its body. I find that beautiful. That’s what you’ve been striving for through three films, beauty. The more I consider the Gold Book, though, the more I feel diminished. No. I was disappointed in the face of beauty failing. I feel diminished in the face of beauty succeeding, because one of us couldn’t achieve it. We don’t endure. We don’t make things that endure like the Gold Book. Even our greatest works last an eyeblink compared to the life of the whale. And this film’s an eyeblink to an eyeblink. The technology that makes it revolutionary today will become obsolete three times over in the few decades I have left. When I’m moldering, it’ll seem as quaint as a rotary phone. Will you make more films then? Yes, I have to. What I take away from the whale’s exchanges is that the one way anyone might endure is by influencing others. Certainly my work records the ideas of those who came before me, and later artists, I hope, will pass along my ideas. And maybe the last work made will be the Gold Book for all humanity. Oddly enough, I’m in the same situation I was in after The Mars Light. I need us to go back to Mars. If our whale died on Mount Sharp and left its Gold Book behind, I bet others did too. It could be a whale graveyard. In fact, maybe that’s why they gathered there. I want to find their books and assemble a history of this great race. Hopefully, if the whales still exist, an orbiter will spot a gathering, which will surely spur the financing. America might even get back in the game. In that case, I’ll put a fourth interview on my calendar, let’s say, ten years from now. I’d enjoy that, Stephen. We can add another page to our books. 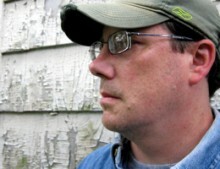 Stephen S. Power’s first novel, The Dragon Round, was recently published by Simon451. His stories have recently appeared or are forthcoming in AE, Daily Science Fiction, Nature, and Stupefying Stories. He’s also a Pushcart-nominated poet with work that has been read on StarShipSofa. He tweets at @stephenspower, his site is stephenspower.com, and his home is in Maplewood, New Jersey.